This is probably my favorite comic so far, art-wise. I actually had some sound effects in there but I took them out… they ruined the atmosphere! A lovely sunrise on the rest of the comic that isn’t the pirate arc. OH by the way the human who came out of nowhere… he’s a member of Goldgills’ crew too! He was in the bar fight and prison, remember? He just had to stay here and guard the ship. Poor thing… or lucky? Sudden sunrise to make the enveloping water look somewhat like sand so that the scene seems reminiscent of a thematically similar scene where a treasure filled cave shaped like a face sinks under stuff, maybe? I’ve returned from the far corners of teh internetz. I MISSED YOU, RANDY. How’ve ya been? Then they get saved by a Kraken. Call it by the name given to it by its people. LINNNNDAAAAA. Oh wow, that IS a really pretty page! I love shading and lighting effects. Whatever brush you used was a good choice. The floor is lava! Luckily the boat is lava proof. OJ, OJ everywhere, and not a drop to drink! If I may, I do have one critique: that the switch to sunrise was very sudden. The previous page seemed to be in deep night, while this is in full sunrise; since I hesitate at the thought of changing those lovely starlight scenes from the previous page, perhaps the first frame on this might show the beginnings of the sunrise, still slightly purple as the scene fades from blue to orange? It is sudden on our part, but they did just move a boat load of loot onto their boat. “Sudden for the reader” is what I meant, I believe: it’s a slighly jarring change, to my eye. You make a good point about it having taken time to move the treasure to the ship, so perhaps instead show that process while underway, with the sun starting to rise, glittering on the gold and picking out the pirates at work? 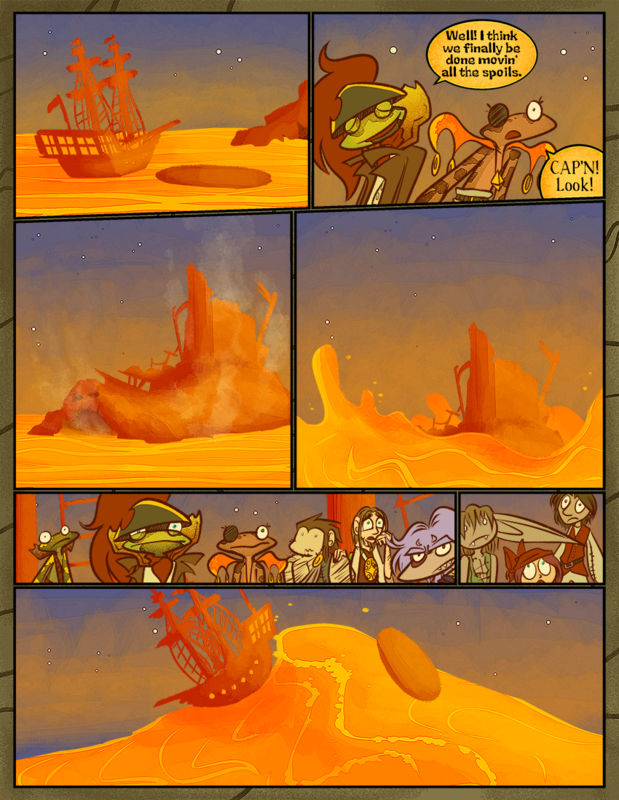 Yeah, the “sudden” shift in color was meant to imply that some time has passed (it took them quite a while to load up all that treasure! ), without having to put in a “later” text box. But if you think it’s confusing, I can do that. Instead of loading onto the ship could the pirates sent the treasure via magic to a safe house or base? I think it was stated that items can summoned from a distant location, but I guess what I am asking is that can items be sent to a distant location through the use of magic? But none of the pirates can use magic except for the Lurkin, and he’s probably not powerful enough to teleport all that treasure over such a distance, except perhaps over a period that would have taken even longer than just moving it on the boat. Not only that, but any safe house or treasure hoard worth anything in Idenau would have magical protections on it to prevent teleporting things in and out. Otherwise, once someone found the location and knew there was gold in there, they could warp all of it into their own possession! Of course, you DO have to have knowledge of where the desired object is in the first place. So you couldn’t just think about riches and magically transport some random gold into your hands (that would make looking for buried treasure too easy). So if a base was REALLY hidden, that would also make for good protection… but still, just think about what a magically powerful ex-crew member could do! I imagine Goldgills’ band are well-off enough that they got the Lurkin and maybe some others to work some spells on their hideout(s) over time. Ship holds are magically protected in the same way. We considered the treasure room having some kind of magic chest that would transport all the treasure to a desired place, but thought that might be too complicated in-comic, and a final-room secret exit method seemed more appropriate anyway. I see what you’re getting at by indicating the passage of time, I just think that a bit of a segue might be called for–whether shifting the time of that first panel, a separate “setting sun” panel, or, as you suggest, a simple “much loading later” narration box. No Monday comic?! Huh Guess I’ll have to reread the dozens of previous comics to slate my thirst for the Fourth. Drink the orange kool aid! You must, it is your destiny!